Now that candidate filing is complete, assuming they waited, operatives for political campaigns are on duty looking for campaign violations committed by opponents. Each election cycle we get word of them and check them out. In the past we’ve had complaints about a firefighter using his gear in campaign ads, questions about requests for information that should be publicly available, a complaint about incumbent legislators wearing their official legislative name tags and too many complaints about sign vandalism to count. This next one, a problem that has been fixed, is one we found. 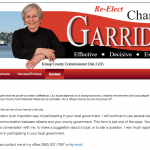 On Charlotte Garrido’s website for her re-election campaign to county commissioner, her contact page had a phone number and email address that took, until sometime Monday afternoon, someone back to county offices. We made a call to Garrido this morning and will post her comment on the matter as soon as we get it. I also just spoke with Charlotte, and she wanted to be clear that this was not intentional, that she wants to be “absolutely, totally legal.” When she was contacted by the PDC, she called her husband and the number was changed. She was also disappointed we didn’t call her before calling the PDC. I did call the PDC first, because I wanted to make sure it was an actual infraction. It seemed like a clear-cut case, but no sense stirring things up if it wasn’t. Once I knew it was, I called the phone number on the website and waited a few hours before posting. The phone number went to Laura Melrose, Garrido’s assistant in the county offices. We spoke with Melrose and she seemed surprised to learn her number was linked on the campaign site. This suggests that not many, if any, people have taken up the offer to contact her from the campaign site. The email went directly to Garrido’s county email address and puts nothing in the subject line. Both items were fixed sometime Monday. Most times these violations can be written off as small mistakes and I don’t suspect Garrido will be penalized for this incident. But the rules are there for a reason. On this one the perception is taxpayers are paying for a campaign. If Melrose had spent any time at all answering a phone call that was campaign related, that’s taxpayer money paying for Melrose’s time. That’s not supposed to happen. Because someone noticed, it won’t anymore, if it ever did. And just in case you want proof the site referred people to county contacts, click on the pictures. One is what was on the site. The other was the email address I saw when I clicked on the link. More to fold into the story. Well, she IS a Democrat, so it is just an “oversight” I’m sure. If it were a Republican, I am sure the SUN would have front page news, editorials, a string of nasty reader comments as well. Maybe I’m being obtuse. But, then, I have been reading this “newspaper” for some time. I wonder what Adele Furguson would have said? Steve, Steve, Steve — keep your eye on Moxie Media, the firm of choice for Ms. Rolfes et al., and their black-bag practices. It will happen, trust me. Kind of strange , even non political employees are made aware of the rules these days. I work for the Dept of Transportation and we have to take a yearly class on ethics and such just to make sure all new employees knw and the older obnes do not forget not to use state supplied property for personal reasons . Interested to hear about this . binewibie its a big deal actually to some . I ran for a school board position back in the 90’s and threw about 20 extra flyers I had into some newspaper boxes i had one night coming home from work . Next morning I get a call from the very leberal editor of the paper then in NK , a Chris Case saying a reporter was going to call me to talk about it to me . Next edition of the newsapper , front page headlines , “Sheldon claims Ignorance to PDC Violations” . Had a picture actually of one of my flyers in a newspaper Hearald paper box , Not kidding , it was like wow , my kids thought I was going to the gray motel . Turned out it was not even a violation , the story ran before the PDC got back to the paper, ” Steve at least talked to one ‘ I called the PDC myself and the fella actually laughed , said they get this every election cycle , candidates using newspaper boxes to save money on postage . Actually not a violation , but the newspaper could make a stink because its the newspaper box is their private property .. In this case the private property being used is the state , sort of like using a mail box instead of the newspaper box I guess. What Bruce said hit home with me , because the newspaper did make a major deal out of it , and the paper defintely had a very liberal view at the time . Betti Sheldon did the same thing actually next election, aliberal democrat state senator and someone called , the paper ran an editorial on it then and Editor Chris Case stated she was stunned by Betti sheldon’s forth rightness and congratulated her integrity in the editorial , I claimed ignorance to something that actually was not against any PDC violation and looked like I was going to jail . But that is politics. Short story , use your own stuff, never return phone calls to newspaper reporters . I’d ask WHY she isn’t punished. Garrido knows the rules and has been through more than three elections. If the law is broken and there is a penalty, she should do the time and fine. Honestly, this plea bargaining crap filters down to actual law enforcement. It’s NOT optional, it’s a law. Probably passed by her own party. If she claims it’s another mistake, well there’s been a lot of them lately. Here she is THE supervising official for the animal control issues. There’s been a questionable amount of activity about the Kitsap Humane Society. It had a botched raid a few months back, some hiring issues, and has been promising a public audit of it’s operations for months. Before that, it was caught taking a man’s dog and adopting it out to someone else, while he spent the night in jail. She wants to claim innocent mistake? I call BS right now. REAL news reporting would answer the longstanding question. Did the county continue to pay KHS for services WITHOUT proper and up to date paperwork?! Obviously the city of Bremerton suspended payments. It’s either a shortsighted and inept mistake, or more of the same incompetent behavior. Well they all seem to get away with “bending” the rules. I’m the person who put the phone number and email address on Charlotte’s contact page. 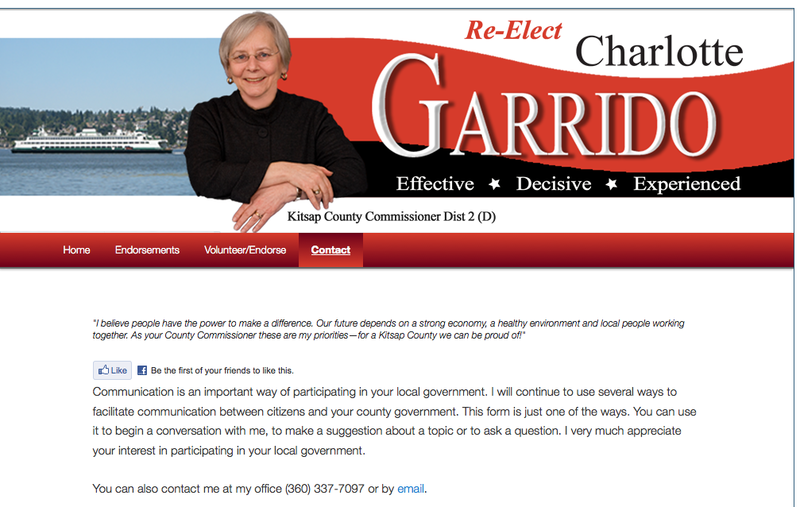 I thought it would give people a way of contacting her about county issues, which is what the text of the page says. It was my mistake. I should have read the rules closer and I changed it as soon as I found out it was inappropriate. It’s really all about intent. Thinking back to the recent error made by Port of Manchester. Error was made by a contractor type employee who mistakenly put their opinion on the Port’s Website regarding non-support of recent port ballot proposition. Mistakes happen. I doubted that port officials were aware of the posting, and I was the one who spotted it! They removed it very promptly and were reminded that they had committed an infraction. That was the end of it. Don’t be surprised to see more candidates “step in it” from time to time as this seasons campaigning unfolds. It’s tricky stuff, and it’ll be interesting to see how the “tarred brush” is applied to others! so glad we’re focusing on the issues the county is up against and not the technicalities of running a campaign. Just figure anything done that can be seen as helping a politician be elected that is connected with a tax payer is pro hibited . Think of that phone in the government building being paid for with tax payer money coming from a starch republican , or the other way around if your a republican in office and the telephone as being supplied by a democrat tax payer . the fax machine , the paper , time at work where your on the payroll and calling anyone connected with the campaign . Normally the spouse weighing in is the kiss of death. Look at that skewed poll. It looks like the Facebookers put the word out. Can the Kitsap Sun IT guy tell if people are voting on the taxpayer’s dime? @ mem, yes you are right. There are so many more important aspects to this race and the issues involved than one candidate getting negative coverage and called on the carpet for a small clerical mistake and another candidate getting special, exclusive, spotlighted positive coverage simply because they are running office when in any other circumstance the event they were being covered for would be pretty much ignored or a minimal blurb at best. Colleen: press is press as they say and this tempest in a tea cup shall pass. I’m sure it won’t surprise those of you who think this stuff is unimportant that I disagree with you. You speak as if because we cover this that we won’t be covering the bigger issues. I don’t have anything to suggest this was anything more than a mistake, but what if there were a pattern of this? In fact, just in your comments you’ve brought up McKenna’s actions in campaigning for attorney general and the trail showing that super PAC donations go up in places where the president campaigns. Those things are worth point out, too. I’m not eager to dwell on this kind of stuff, but when a mistake or willful misdeed happens, we’ll cover it. And I take comfort in the fact that if we didn’t, we’d get criticized for that. To be criticized for going too far is a better alternative. I thought you covered it fine , I would think it would have been bigger news actually . As I said I got front page news in the Herald for about 25 zeroxed flyers with big wording on the Front page about CLAIMING IGNORANCE . The paper actually got the facts wrong in regards it was not a PDC violation , and never even printed a we goofed on the back page later . When i was interviewed for the paper the reporter actually argued with me about some of my positions . I thought that was so weird . The Sun sent me a letter saying not to use their newspaper boxes . I did not find anything wrong with your coverage , and Garriddo was defensive and I totally understand that also . I disagree with her politics , but I do not believe she intentionally would do anything against campaign laws from the me knowing her from a few meetings when I served on the Human Rights Council . From your coverage i got that impression also , this was a mistake. The reporter stated he called the PDC in my case but did not get through . You seemed to do the right thing , called the source that is in charge of keeping our candidates accountable and printed what you found with an attemt to smear or cover up . I sure wish local media would figure out that Sir Spam A Lot is using your pages as free advertising for his campaign. Seems he is in constant violation of your TOS but still her persists with the seizure inducing poorly made videos filled with bizarre out takes and pirated use of other’s creative work in the way of film (MGM) and music (Sony, etc). Heck, I hear tell his signs he planted without permission on BIPD property were recently confiscated. He already has been banned from commenting on the Sun’s online paper. Now he trolls all the Facebook pages for the seven sisters in the 23rd. Does his madness know no bounds when it comes to cheesey videos?